Book your transfer with American Shuttle LLC on our Airport Shuttle Bus service today! At American Shuttle LLC our Airport Shuttle Bus service is available for transfers between Long Beach Airport, and 38 locations across United States. The Airport Shuttle Bus service aboard American Shuttle LLC is an affordable on-demand door-to-door shuttle service. Your vehicle will be shared with others and will make stops for passengers travelling nearby. Your pick-up and travel time is flexible and will be adjusted to suit all passengers travelling together while making sure everyone gets to their destination on time. Our Airport Shuttle Bus service is available 24 hours a day 7 days a week and can be booked up to 24 hours ahead of travel. 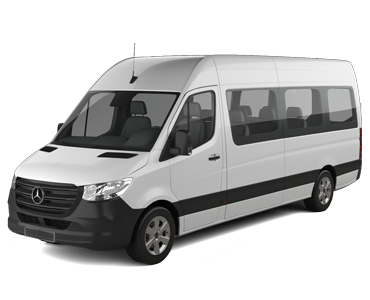 At American Shuttle LLC we offer fixed transfer fares starting from $26.67 USD total one-way and with enough seat capacity for up to 8 passengers. Your final fare with us includes luggage allowance for 1 carry-on bag and 1 check-in bag per passenger. Also included in all our fares are airport parking fees, any tolls along the route and your drivers waiting time. American Shuttle LLC is a transport company based in United States and we have been a professional transport supplier on Jayride since August 2017. American Shuttle LLC is a shuttle and transportation company servicing the LA area including Orange County, Riverside, and San Bernardino. We offer a lineup of vans, cars, SUV's, and other vehicles in our fleet to make your experience from point A to B a comfortable and easy-going one. Our service is VIP at any given time. Driver was very prompt and texted me upon arrival. Instructions were very clear. Driver friendly and vehicle was comfortable and clean. Would use American Shuttle again. Driver (Six) was excellent. He drove us to the airport on time and in a safe and friendly manner. Would use this shuttle service again. Driver texted with exact pickup directions. Very courteous and helpful. Good experience. Arrived safe at our destination with no problems. Would use again..
Our driver was very courteous and on time. It was a comfortable ride all the way. Great service, friendly driver, awesome price! Would do it again.